On March 14th, members and friends of Greensboro UCC gathered for a service of solidarity with and support for students across the country who are working for safer schools. Overnight, we had received 8-12 inches of snow. Our parking lot was covered and the roads were not much better. I had good reason to believe that our 10 am service would not be well attended. In fact, our deacons had met on a conference call the prior evening due to inclement weather. I had told them to stay home in the morning if they had any doubts about their safety. Minutes before the service was to begin, safety and caution appeared to be ruling the day. Then, someone handed me a note and said, “We need more copies.” What we thought would be more than enough bulletins for the small crowd we had anticipated had suddenly become not enough. Our service was brief. We prayed, sang and said the names of those killed in the Parkland shooting. Then we spoke the names of loved ones we had lost. We also said the names of students and school personnel, entrusting them to the care and protection of God. To conclude our time together, we rang our church bell seventeen times, once for each victim of the Parkland shooting. 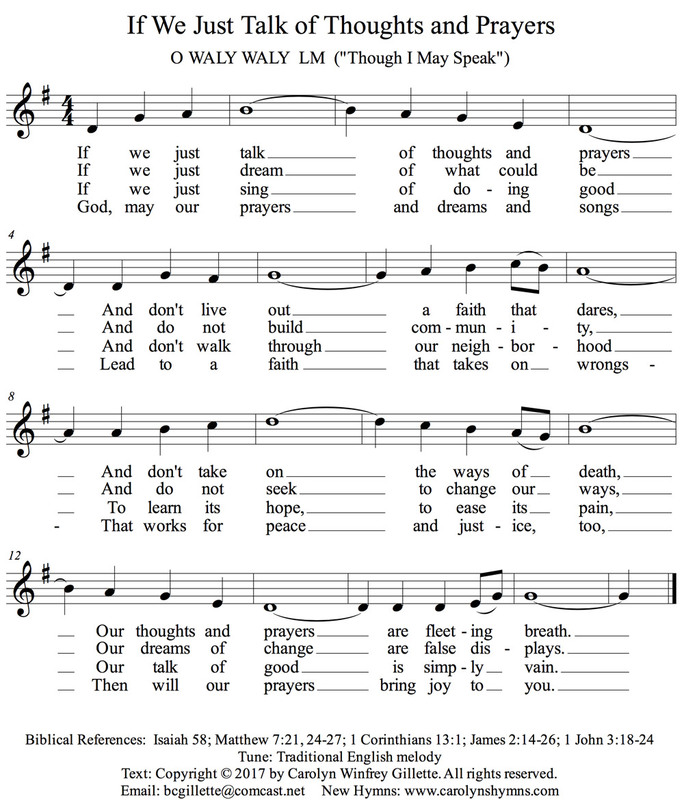 Permission is given for free use of this hymn in a church. Personally, the service was meaningful to me in several ways. First, the attendance was a bit overwhelming. Given the weather and road conditions, I had expected only a handful of people to attend. The extra effort that people made to get to this particular service spoke to me about the concern and commitment in our community for the safety of our children. I was encouraged that even after Parkland, even after Las Vegas, even after Charleston, even after Orlando, even after Virginia Tech, even after Columbine and all the other shootings since that one, there are still people who will gather together to pray. “Thoughts and prayers” have been the primary response to these mass shootings. While I believe they have always been offered with sincere concern and care, they have not done much in the way of preventing the next one. So, I saw in our gathering together an expression of hope and faith in God that we can find a way forward in making our children safer while they are at school. A ministerial colleague has suggested that these students raising their voices and walking out of school may be the way God is answering the countless multitude of “thoughts and prayers” that have been offered in the aftermath of previous shootings. Imagine that, God turning to children to do what God wants done in God’s world. Could God use young people who refuse to remain silent and who refuse to sit still to move this conversation to a better, more productive place? I think my colleague could be right. Something does feel different this time. I pray that he is right. Indeed, may our prayers and our actions lead to safer schools for all of our children.